Israel's Ambassador to the United Nations, Danny Danon, on Wednesday called on the Security Council to condemn the infiltration of Israeli airspace by an unmanned aerial vehicle launched from Syria. “Earlier today, an unmanned aerial vehicle (UAV) was launched from Syria into Israel, penetrating 9.6 kilometers into Israeli airspace and threatening the safety and security of Israel’s northern cities and towns. Thankfully, the Israel Defense Forces intercepted the UAV, preventing the possibility of a more serious security incident,” Danon wrote to the Council. He noted that Wednesday’s incident comes during a time of heightened tensions on Israel’s border with Syria. “We have repeatedly warned the Security Council of the destabilizing activities taking place in Syria and the threats they pose to Israel and the Middle East. Israel holds the Syrian government accountable for every attack originating from its territory. We will not tolerate breaches of the 1974 Separation of Forces Agreement and will continue to defend our citizens and our territory from any threat or violation of our sovereignty,” wrote the Israeli Ambassador. 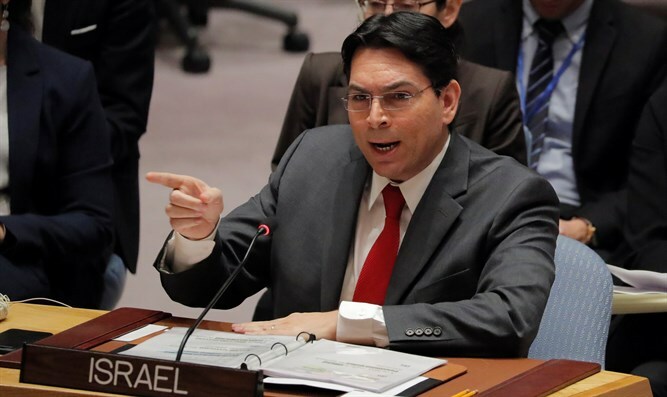 “I urge the Security Council to condemn this dangerous act that not only threatens Israel, but the stability of the entire region,” Danon concluded. The UAV was intercepted by an Israeli Patriot missile. The launch of the missile caused sirens to sound in communities in the Golan Heights and the Jordan Valley. IDF Spokesman Ronen Manelis said later on Wednesday that the IDF was in control of the situation at any given moment.